Update: This recipe has been selected as Top Five! Please, if you like it, vote for the recipe to make it a winner by clicking on this link. Thank you! Instead of creating a dessert recipe, I chose to go in a savory direction. 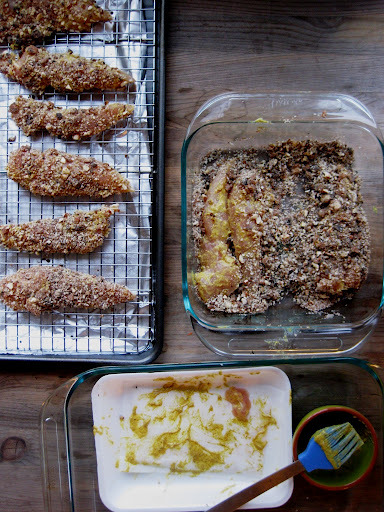 I crushed the cookies in a food processor and used them in combination with Panko crumbs, almonds, and Szechuan and Cayenne peppers as a coating for chicken tenders. 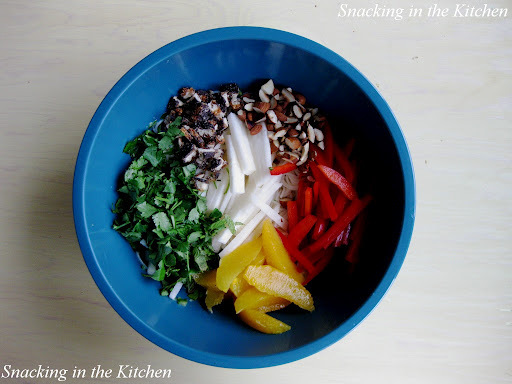 And because you can never have enough cookies, I added extra Samoas to the rice noodle salad. 1. Preheat oven to 375 degrees. 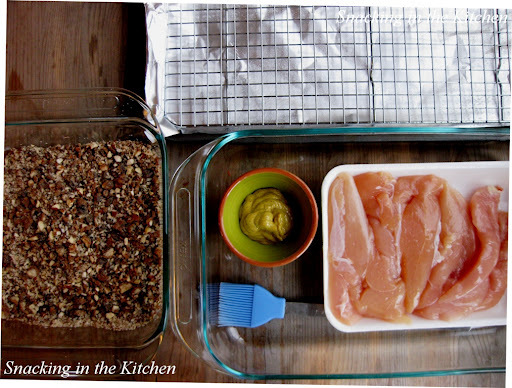 Line a baking sheet with aluminum foil; set a cooling rack on top of the baking sheet. 2. Pulse Samoas and almonds in a food processor (separately), until coarsely ground. 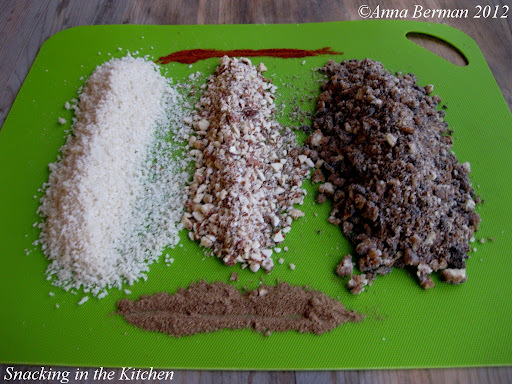 Combine Samoas, almonds, bread crumbs, pepper and salt in a bowl. This is the coating for the chicken tenders. 3. 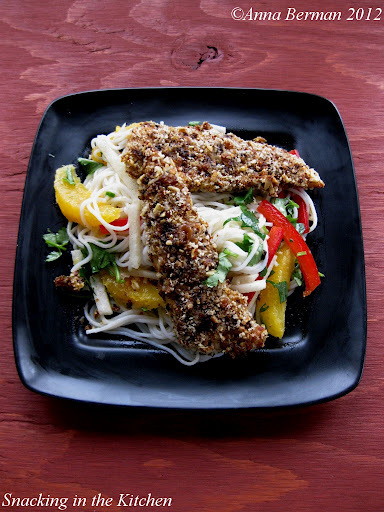 Brush chicken tenders with spicy brown mustard. Press the tenders into the Samoas coating and place on top of a cooling rack. 4. 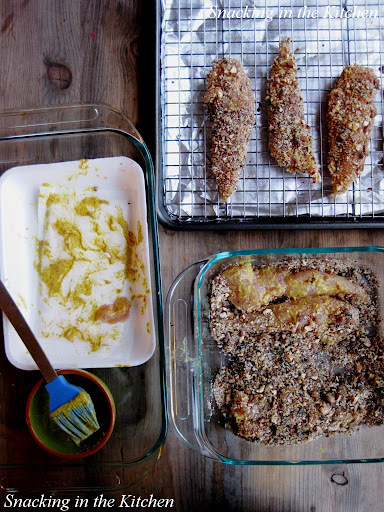 Bake the chicken tenders for 30 minutes, flipping half way through. 5. 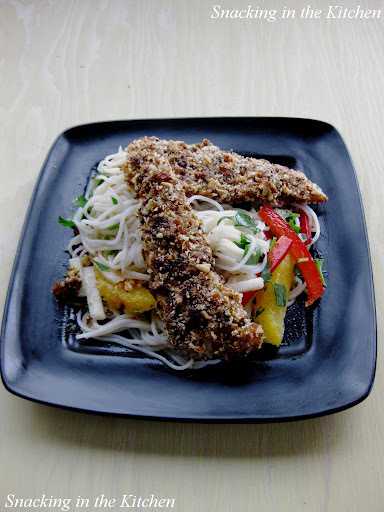 While the chicken tenders are baking, cook the rice noodles according to the package directions. 6. In a large bowl, whisk together the dressing ingredients. Once cooked, rinsed, and drained, add the noodles to the dressing and toss to combine. 7. 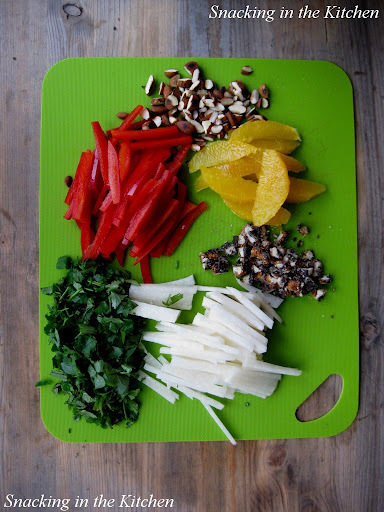 Add the remaining salad ingredients to the noodles. 8. 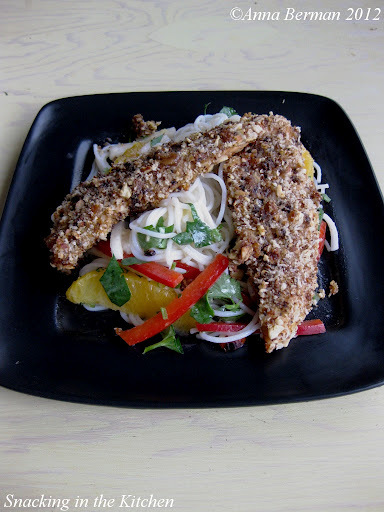 Serve the Samoas chicken tenders on top of the salad. When it comes to developing a recipe, you can never know exactly how it will turn out until you eat it. I can’t tell you how many people warned me that chicken and Samoas would be a weird combination. Eat your words! 🙂 This salad came together like a happy troop of Girls Scouts. 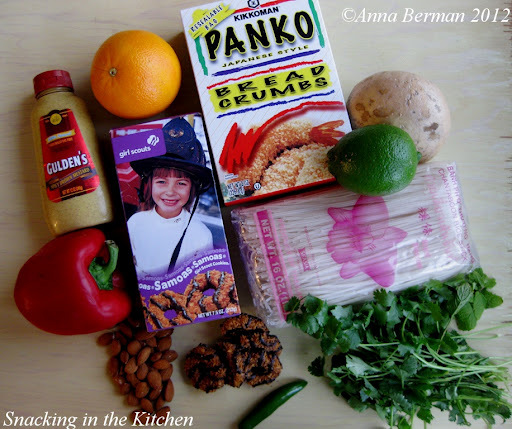 Spicy and sweet at the same time, this is a healthy and fun way to enjoy Samoas for lunch. And go ahead, have a few extra for dessert! What is your favorite Girls Scout cookie? Please vote for the recipe is you liked it! Thank you! What a great looking recipe! I'll let you know how it works out for us. Thank you! Have you had a chance to make this recipe yet? This looks AMAZING! Coming from a vegetarian, too 🙂 Question: How does one get you to make it FOR them?